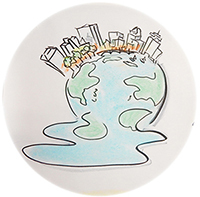 A team of graduate students at UMass Boston had an ambitious idea to facilitate a one-day conference on Climate Change in Boston. The participants came from diverse areas of expertise and perspectives on the topic (urban planners, artists, policy-makers, academics, researchers...) and many did not know each other. The team asked me to lead a 15-minute icebreaker at the beginning of the conference and a 15-minute debrief ‘mosaic’ at the end. A lead facilitator would guide the flow between panel discussions, small-group and large-group activities. The goal for the warm-up was to get people thinking expansively and talking to one another right out of the gate. I crafted a "What Hat Are You Wearing Today?" exercise where participants talked about their perspectives on climate change in table groups. They then generated + and - lists to start some divergent thinking regarding climate change. The team also talked about capturing the key ideas from the various all-group conversations. They had never heard of Graphic Recording before, but upon hearing a description, they agreed that it was exactly what they had "pictured." The goal for the wrap-up exercise was to leave participants with a chance to "lock in" their key takeaway from the day, and a sense of hope for the future. 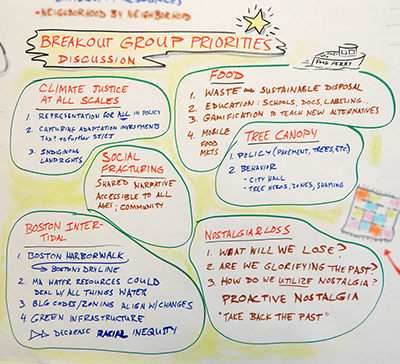 I posed the question, "Now that you have had a chance to kick around a number of ideas, questions and possibilities related to climate change in Boston, what is one thing you want to take away from the day?" and let each participant create something using 3D materials. Then each table group combined their creations and presented their merged concept to the larger group. The creative "buzz" in the room was palpable, the thoughtful discussion was loaded with opportunity, and the volume of ideas generated made us all a bit dizzy by the end of the day. The combination of photography, videography (the day was live streamed) and traditional note-taking gave these researchers a wealth of information and a very thorough capture of the terrific questions, issues and ideas generated. My Graphic Recording images were distributed by PDF to the sponsoring organizations, participants, etc., and I hope included in the students' final reports! They were also posted on social media so participants could spread the word about the project and let their employers know what they had actually done that day!